The churn in ICT industry is happening at a rapid rate. Yesterday's technologies are falling wayside beyond recognition. The era of smartness is round the corner. The large variety of applications is limited by imagination in minds. But ensuing challenges can only be met by solid and profound technically competent human resource base. This is really a glaring weakness in country's technical education system. Over the years, an impression is created that ICT is all about software development – read good code writing and customization. Clearly, this is not sufficient in this highly competitive world. Software is not developed in vacuum. It follows the standard development trajectory: idea generation, analytical modeling, experimental/simulation based verification, prototyping and product development. Domain knowledge cannot be downgraded in favour of software packaging, as the former determines the limitations and overall framework of deployment. Also note that this knowledge is not static – both in terms of concepts and volume. It is here the technical institutions and industrial conglomerates should establish a meaningful and far reaching dialog. The current engineering curricula has deemphasized the deep technical understanding with the result that a large portion of the current work force is unable to meet high-end challenges such as design of superior aerodynamics, smart materials, new drugs, neuro-computing. For achieving a superpower status in ICT, development trajectory cannot be broken, and only the cycle can be shortened. It is time for pondering. Established in 1865, ITU has reaffirmed its reputation worldwide as one of the most resilient and relevant organizations and continues its work as the specialized agency of the United Nations, and its oldest member, dealing with state-of-the-art telecommunications and information and communication technologies. The remarkable history of ITU exemplifies its stellar role in connecting the world to the most advanced and innovative means of communication, from the days of the telegraph to the Internet and mobile broadband, which now allows us to be in touch anytime, anywhere with friends, family, colleagues and even things. As we celebrate our 150th anniversary, we look back with pride at our accomplishments. And we look forward to the future as we respond to the rapid changes in the global ICT environment. Dr B S Murthy, Executive Director C DAC, was the chief guest. During his address, he discussed some recent developments in ICT areas such as digital wallet , digital locker for documents and Government initiatives. Brig Chowdhry (Retd), Fellow and Member Board of Governors ICEIT presided the function. 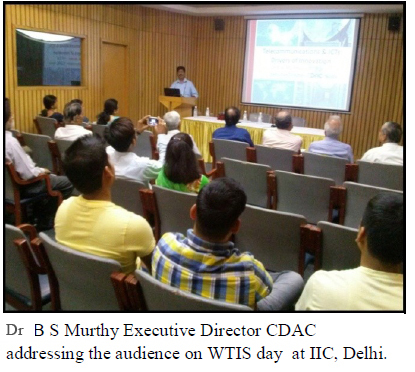 ICEIT Convention and Conference were successfully held on 16-17 April 2015 at the India International Centre , New Delhi. The theme of the conference was Advances in Mobile Communications, Networking and Computing. More than seventy professionals attended the convention and the conference and more than forty papers were presented. The participants included Telecommunication System Technologists and Managers, Government Departments and Agencies, Academic and R&D Institutions. Shri Vipin Tyagi, Executive Director, Centre for Development of Telematics (C-DOT) inaugurated the Conference. The following best papers were recognized and awarded in their respective categories. Prof. (Dr.) M. Salim Beg received B.Sc. Engg. (Hons) from AMU, Master of Engg. (Communication Engineering) from Indian Institute of Science, Bangalore. He was awarded prestigious Commonwealth Scholarship for doing research at Loughborough University, UK from where he was awarded his Ph.D. for research in the area of Digital Communications over Mobile Channels. His academic and research interests lie in areas of Mobile Communications and Computing, Wireless Networks, Multimedia Communications, Computer Networks and Consumer Electronics. He has supervised a large number of post graduate and doctoral theses. He has more than 150 research publications in journals and conferences of repute. A lot of his recent research has been related to multimedia data transmission over mobile links, and wireless networks. He has conducted several short courses and pre-conference tutorials in many countries including Malaysia, Bahrain, and Saudi Arabia for industries as well as academics. He has served on the technical program committees of several international conferences. He has chaired a number of sessions at several international conferences. He has delivered invited lectures at several places including ITI at Bangalore, TCIL, C-DAC, and DRDO establishments. "In recognition of his outstanding professional contributions to the area of Communication, Information and System Sciences in the broadest sense , and thereby bringing the glory to the profession, ICEIT is proud to confer Fellowship of the Institution on Prof (Dr) Salim Beg." Prof Sanjay Tanwani is currently Head of School of Computer Science at Devi Ahilya University, Indore. He received B.E. (Electronics & Communications) from GSTI, Indore and M.E. (Computer Science) and Ph.D. (Computer Science) from Devi Ahilya Viswa Vidyalaya (DAVV) University. Prof Tanwani has a varied experience. He joined DAVV computer centre in 1986 and later joined the faculty of Computer Science in 1990. He became a professor in 2000. During 2000-2003 he worked in the Internet Software Division of Impetus as a Consultant – a valued industrial experience. He has been Dean of Engineering Sciences at DAVV during 2010-2012. He served as a Member, Executive Council of DAVV during 2011-12. Prof Tanwani conducts applied research and development activities in the general area of software systems and databases. He has done consultancy and development work for package based softwares like 'Thermal Simulation of Building and contributed to the development of various softwares such as examination system, and evaluation system for DAVV university. He received best teaching awards in 2006 and 2009. He developed new areas in computing He has been active in Data Analytics, E-Governance and Data Mining. Dr Tanwani has been member of various MP Government E-initiatives and State Bank of India committees. He has published a large number of papers and is actively involved in more than a dozen Ph.D. supervision. He has attracted various high-value sponsored research projects to DAVV. He has been active in educational system planning and has delivered several talks in his area of speciality. He is Member IEEE and Member ACM. He is leading ICEIT DAVV chapter which is amongst the most vibrant chapters. "In recognition of his outstanding professional contributions to the area of Software Systems, Databases and Information Sciences in the broadest sense , and thereby bringing the glory to the profession, ICEIT is proud to confer Fellowship of the Institution on Prof (Dr) Sanjay Tanwani." The Annual Convention of the Computer Society of India (CSI) for the year 2014 was held at Hyderabad in December 2014. During this Convention, Brig S V S Chowdhry (Retd), a member of the Board of Governors of the ICEIT was conferred the Lifetime Achievement Award for his contribution to the CSI and the IT profession. Brig Chowdhry has been a member of the CSI for four decades. He was President of the CSI during 1992-94 and received the Fellowship Award of the CSI earlier in 1990. He had a long association with the South East Asian Regional Computer Confederation (SEARCC) and has participated in SEARCC Conferences / Council meetings in several countries. He has also represented the CSI in the International Federation for Information Processing (IFIP). Brig Chowdhry was President of the IETE during 1994-96 and is a Distinguished Fellow of this Institution. He was President of the Computer Sciences Section of the Indian Science Congress and a member of the ISCA Council during 1997-98. He is a Fellow of the Institution of Engineers (India) and was Chairman of its Computer Engineering Division Board for six years. He was also Chairman of the Board of Governors of the Safety & Quality Forum of the Institution of Engineers (India) for three years. Our congratulations to Brig Chowdhry on the well deserved Lifetime Achievement Award conferred on him by the CSI. Mrs Smriti Dangur has been re-elected as president IETE for the second term. She has M.S. in Computer Science from Rutgers University, USA, and B.E. (Hons) in Electronics Engineering from BITS, Pilani. She has been involved in conducting MIS courses in various Gujarat University institutions in MBA and MCA programs and also the PG Program of All India Management Association. She has 35 years' experience in Academics and Industry in India, Liberia - West Africa and USA. She has been an entrepreneur and awarded the best entrepreneur's award from Gujarat Chamber of Commerce and Industry and GIDC. She has been invited to deliver keynote addresses in ISRO, Ahmedabad. She has been Fellow of IETE since 1986 and the Council member for three terms. She was Zonal Coordinator (2009-2012) and established three Sub Centres. She has been Chairperson of various committees of IETE. She was the convenor of the Annual Technical Convention and organized very successful exhibitions in 2004 and 2011 in Ahmedabad.. She is also a member of CSI, and served as a committee member in Ahmedabad Management Association, The Old Xavierites' Association and other Associations. Mrs Dagur is a member of Board of Governors of ICEIT. Our congratulations to Mrs Smriti Dagur for her reelection as IETE president. Electro -Quiz Competition organized by ABES Engineering College, Ghaziabad on September 8- 9, 2015. ICEIT Chapter was inaugurated at Mharana Pratap University of Agriculture and Technology (MPUAT), Udaipur on September 4, 2015. On this occasion Seminar on Brooadband Technologies for ESDM Sector: Indian Perspectives was organized which was addressed by Dr P K Dashora, Vice Chancellor, MPUAT, Prof Sandeep Sancheti, President, Manipal University, Jaipur, Mr B M Baveja, CC &BT, Department of Electronics and Information Technology, Govt. of India, and Prof H M Gupta, President, ICEIT.